Do you live in an older home? Thinking of renovating? It's important to do it carefully. Dust and chips from old (pre-1978) paint are a serious threat to little kids. LA County director of public health Jonathan Fielding says, "Most children with high lead levels do not look or act sick, but they can suffer long-term health consequences" if parents aren't careful. High levels of lead can cause learning and behavioral problems. Children living in (older) homes being remodeled are especially vulnerable. The biggest concern is for little kids, because they often put their hands in their mouths. My family lives in an older home. So we keep an eye on chipping paint, and vacuum and mop weekly. Families living in older homes should also wash kids' hands frequently, and pay particular attention to doorways, windows, and other places paint tends to wear away. A pediatrician can check your child for lead with a blood test. You can get more information through LA County's lead poisoning prevention hotline 1-800-LA-4-LEAD. Last weekend, my 18-month-old saw his first sunset. We were munching muffins by an outdoor fire at the Huntington Beach Hyatt. Pointing at the red orb melting into the horizon, I said, "The sun is going down. It will come back up tomorrow." My son commented, "Sun, run away!" The three-day weekend was also my son's first toddle on a southern California beach. He'd already dug his little shovel into beaches in Oregon and northern California. But I'd shied away from hauling him across LA--on the 10 Freeway--to a beach here. I'd no sooner get there, I thought, than I'd have to race back for nap- or bedtime. So I planned three (off-season) days on the OC coast. You might enjoy the itinerary below for a local mini-vacation. Rooms at the Hyatt are reasonably priced for a posh, beachfront resort ($215 a night). But be forewarned, Hyatt reaches deep into your pocket for everything else: $25-a-night parking, $9.95-an-hour internet, etc. AM: Bike the beach. We pedaled to the pier for a good look at the surfers below. On a small lawn at the pier plaza, my son, Mateo, ran around with other kids. He was also interested in the volleyball players, dogs, rollerbladers, etc. There are a couple of places to rent bikes just south of the Huntington Beach Pier. You can also get them the Hyatt. All of these shops have bikes with kid seats. PM: Cruise around Newport Bay. Another first for the baby: We boarded a Fun Zone Boat Co craft ($14, $7, under 5 free), and putted around the harbor, peering at luxurious homes and lolling sea lions. Back on shore, Mateo rode the merry-go-round in the Fun Zone amusement area. After selecting a few shells, we dinned on balcony at a dockside restaurant. In Newport, you can also hop on a whale-watching boat (June-October) or rent a Duffy (electric) boat and tool around yourself. Whale- watching trips last three hours, so I don't recommend them for the wee-ones or the weak-stomached. Fun with floaty toys in the big swimming pool. Then hang at the beach. AM: Swimming in the Jacuzzi! At 18-months it's all swimming to our son. And kids aren't barred from the ones at the HB Hyatt. (Be careful not to let a small child stay in a hot tub too long, especially if it's truly hot.) This resort also offers many pretty pathways and nooks that are fun to explore, as well as exuberant fountains, fireplaces, and small lawns. PM: After a near-record, 3-hour nap for the boys (and some "book in a nook" for mom), we lit out for the Discovery Science Center in Santa Ana. Mateo was mesmerized by small balls swirling in a gravity well, but the real fun here is for older kids. We returned to HB for dinner--and another runaway sun--at Duke's on the beach. At last, sandcastles and wave running. I was pleased to see there were probably more birds than people on the beach (on a weekday morning). I focused my binos on a flock of terns resting at the water's edge. The sea was a brilliant, endless blue. After checking out, we drove a few miles north on Pacific Coast Highway to the Bolsa Chica Ecological Reserve. I'd covered the restoration of this marsh as a reporter, and wanted to see how it looked two years after tidal flow had returned to the area. A variety of marsh- and shorebirds were sheltering near the foot bridge. Brown pelicans plunged out of the sky, scooping up fish. It was close enough--and the birds big enough--for a baby to get a good look. Our son has been talking about "birds fish" ever since. This dudleya is one of the many gorgeous blooms you can see in Stough Canyon in the spring. The nearby nature center makes this a sweet destination. But I wouldn’t hike this with little kids, simply because the trail is so steep. It’s also quite hot in summer. However, after huffing and puffing up the big hill, you’re rewarded with good views of Burbank and the Verdugo Mountains. I’ve trekked here a couple of times in spring with botanist Ileene Anderson. We say nearly a hundred species of wildflowers, including wooly bluecurls;6-foot-tall scarlet delphiniums; caterpillar phacelia (they have curved, fuzzy, purple flowers); golden-back ferns; bright red members of the carnation family called "Indian pinks"; elegant clarkia, monkey flower, and California sunflower (encelia). From the 5 Freeway, exit Magnolia Blvd. Turn right on Magnolia (heading toward the hills). Turn left on Sunset Canyon, then right on Walnut Avenue. Follow Walnut until it ends at the nature center. The trail is to the left of the center. For more on native plants, check out my Southland Ecology and Gardening posts. Recommended reading: California Native Plants for the Garden by Carol Bornstein, David Fross, and Bart O’Brien. A report out this week finds almost one in four of the Earth’s mammals are in danger of extinction. The study was conducted by the International Union for Conservation of Nature, an organization of governments, NGOs and scientists. IUCN says forty percent of the planet’s mammals are struggling to survive in smaller and degraded habitats. In California, we have a lot of animal species that don’t live anywhere else … and many of them are also on the edge of extinction. That includes sea otters, red-legged frogs, desert tortoises, San Joaquin kit foxes, peninsular big horn sheep, southern steelhead trout … to name a few. And it includes an animal beloved by visitors to the Channel Islands. Here's my report. DENNIS: We have a release going on today. We’ve caught them this morning in their pens and we’re going to fly across the island and release them. SETZIOL: so these animals aren’t found anywhere else in the world? SETZIOL: As we leave the Ventura coast, we see the four northern Channel Islands rising out of the sea … blue-black, and backlit by a swath of sunlit sea, shimmering platinum and gold. San Miguel looms on the horizon, ringed by fog. SETZIOL: We pick up additional passengers: four little foxes, each about the size of a house cat. They’ve been part of a captive breeding program trying to keep Island Foxes from going extinct. SETZIOL: So they look a bit like the mainland grey fox. SETZIOL: The tawny and gray foxes are curled up in portable kennels. They’re silent and motionless, but their eyes are wide open and alert. The biologists put on them on the plane for a short flight to the other side of the island. SETZIOL: Island foxes live on six of the Channel Islands. Each island has a genetically distinct subspecies of the dainty fox. 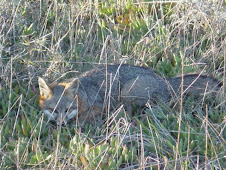 Ten years ago, the foxes on the northern Channel Islands began to die off rapidly. The problem??? Feral pigs left over from ranching days attracted golden eagles to Santa Cruz Island. The eagles feasted on an abundant supply of piglets, and evidently found the foxes to be a satisfactory hors d’oeuvre. And the foxes were sitting ducks, so to speak, because they weren’t accustomed to being preyed upon. Biologist Rosie Woodroffe is one of a team of scientists advising the park service on fox recovery. WOODROFFE: Most animals active in the day are constantly looking for predators, looking up. Foxes are not that vigilant because they spent thousands of years not needing to be vigilant. When you’ve got an animal with no anti-predator behavior at all-there’s very little you can do to convince them to look up! SETZIOL: On the northwest side of San Miguel Island, the biologists unload the foxes. Then Mitchell Dennis and Debbie Watson listen to beeps transmitted from radio collars around their necks. DENNIS: that’s the mortality mode on her collar. WATSON: It’s not supposed to do that. DENNIS: Shake the collar, but you really can’t shake the fox, though. SETZIOL: They decide to replace the broken collar. DENNIS: Calms them down to have a bandanna over their face. SETZIOL: Dennis says the Park Service has been capturing and relocating golden eagles … and it’s hired hunters to kill the feral pigs. So it’s safe enough to put some foxes back into the wild. DENNIS: And they just do better in the wild. We had 4 females and 6 males released last year, and those 4 females produced at least 9 pups. All of our captive pens where we had 40 to 50 foxes, but we only had 8 pups between all of them. SETZIOL: But a few--maybe 4--eagles have evaded capture and are still snacking on foxes. Last year, they killed 11. Biologist Rosie Woodroffe. WOODROFFE: It’s true golden eagles haven’t been seen on San Miguel, but they have in the last few months killed at least one fox on Santa Rosa Island, which is a stone’s throw away. And it only takes one eagle to decide to fly over to San Miguel for a few days and they could take out the whole released population on San Miguel. It’s still on a knife edge whether the foxes will survive in the wild. SETZIOL: Woodroffe says the park service should at least consider killing some eagles if they continue to evade capture and feed on foxes. But it’s not clear if killing the birds would be easier or cheaper, and it would certainly spark outrage from animal rights groups. So to ensure the survival of the species, some foxes will remain in captivity. This year, the biologists will let them choose their mates, instead of pairing them by their genetics. SETZIOL: With all the collars working, Debbie Watson and Mitchell Dennis, open the kennels. And the captive-born foxes take their first steps into the wild. WATSON: He’s heading off towards point Bennett! SETZIOL: Three of the foxes bound out of sight. But a young female ventures only a few feet, then hunkers down in the grass looking a bit stunned … and uncertain. From Channel Islands National Park, Ilsa Setziol, 89.3, KPCC. One of the things I most enjoy about reporting on the environment is learning about the natural world. To bend over a flower with a botanist who points out the nectar guide—a structure or marking some flowers have evolved to draw in pollinators. If you’re curious about local landscapes, check out these stories. Then you can impress friends with such offhand comments as, "Well, southern California IS one of only five places in the world with a Mediterranean climate.” You might want to have an idea what a Mediterranean climate is, so read on…. The modest shrubs and small plants that dominate our local natural landscapes may not look all that impressive when you whiz by on the road, but southern California is one of the world’s hotspots of biodiversity. In the first of two reports, KPCC’s Ilsa Setziol introduces us to some of the unique plants that have evolved in our uncommon climate. SETZIOL: On a late spring morning in the Santa Monica Mountains, a small creek weaves through slanting sycamores and wispy-leaved willows. Nearby, botanist Phil Rundel strolls along a hillside dappled with wildflowers, twisted oaks, and delicate-flowered shrubs. He stops to point out a spurt of bluish purple blossoms. RUNDEL: Those are delphiniums. There’s two native delphiniums….this one comes up in grasslands every year. RUNDEL: yeah, just a little less robust, ..probably one in nurseries are just bred from these. SETZIOL: The delphinium, like many of our native plants, is only found in southwestern California. SETZIOL: Around the bend, a rotund black bee is sampling the tiered blooms of a white and magenta flower called Chinese Houses. Rundel bends over a neighboring plant: an orange-flowered bush called Sticky Monkey flower. RUNDEL: Bees and birds both pollinate that. Flowers like this you can see they’re really designed more for bees, though, because they have a landing strip… these markings on the lower lips of the flower are kind of like a landing strip for bees come in. SETZIOL: Rundel is walking in UCLA’s 300-acre preserve called Stunt Ranch. It’s one of the places where he researches the world’s Mediterranean ecosystems. These are five areas of the planet that sit at about the same latitude and have similar climates: mild, wet winters and warm, dry summers. They are: of course, the actual Mediterranean basin; central Chile; the cape region of South Africa; southwestern Australia; and ….California—with the exception of our deserts. Rundel says conservation biologists have singled out these areas as crucial for preserving the world’s biodiversity. RUNDEL: Only about 2 percent of the world has this kind of climate regime…it’s one that attracts a lot of us…but as a result, they’re some of the most threatened areas ecologically in the world because of population growth, urbanization, clearing of native habitats. We worry about rainforests and rainforests are clearly worth saving, but this 2% of the land area of Mediterranean climates has 20% of the plant species of the world. SETZIOL: Botanist Phil Rundel says because the plants in these areas have evolved to survive in similar climates, many of them share similar traits: for example, California’s evergreen shrubs like Manzanita and Toyon resemble Mediterranean olive and strawberry trees. RUNDEL: being an evergreen shrub with leathery leaves is a good solution to living in these environments and that’s what the dominant species are, particularly where water is limited. Their leaves don’t lose moisture very readily so they’re here all year round. In the summer they hunker down and if it’s cool they can start growing again. SETZIOL: These plants take advantage of the mild climate, photosynthesizing year-round. And their tough leaves help them fend off herbivores … plant-eating animals. These shrubby, evergreen plant communities in southern California are called Chaparral. Our other Mediterranean shrub community—called sage scrub—is even rarer. About 80% of the coastal variety of sage scrub has been lost. Because everybody loves living on the coast. Ileene Anderson is a botanist with the California Native Plant Society. ANDERSON: It’s made up of plants that usually have very small leaves. It’s often called soft chaparral because it’s smaller and easier to walk through than true chaparral. It’s also seasonal… loses its leaves during the summertime when resources are really limited…waiting out the drought, for fall rains to grow again. SETZIOL: Anderson is hiking a section of the Verdugo Mountains, near Burbank, where sage scrub and Chaparral intermingle—the sage scrub dominating in the hotter, drier places. At the top of a steep hill, she’s greeted by a minty and lemony smell. SETZIOL: Nearby, a plant called wooly blue curls--because of the velvety bracts at the base of its chiffon-blue flowers—emits a perfume that mingles mint with hints of pine. Many plants from the Mediterranean basin—rosemary, lavender, thyme—are similarly aromatic. It’s a way plants in both places repel grazing animals; and makes them great companions in southern California gardens. But some plants from the Mediterranean basin have become unwelcome guests here. They’ve taken up permanent residence and are threatening our native plant communities. JON KEELEY I can easily picture in the next several decades southern California looking like the Kona coast of Hawaii, where you almost can’t find a native plant anywhere on that landscape. SETZIOL: That’s our story tomorrow. You can’t help but notice: whole canyons, entire hillsides that used to house communities of plants and animals are now budding with new homes for… humans. Less obvious, though, is another threat to our natural communities: innocuous looking foreign plants that—with human help—have the potential to radically change our rare ecosystems. KPCC’s Ilsa Setziol explains in our second report on southern California’s natural landscapes. 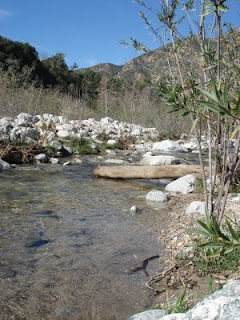 SETZIOL: Stough Canyon in the Verdugo Mountains is a marvelous place to gaze at native plants. In a couple of hours of hiking on a May or June day, you can easily see about 100 species: 6-foot-tall scarlet delphiniums; caterpillar phacelia with curved, fuzzy purple heads; golden back ferns; holly leaf cherries; bright red members of the carnation family called “Indian pinks” …. and much more. Botanist Ileene Anderson recently trekked up a fire road into the canyon. The hillsides were also covered with a deep pink flower that has four slender, diamond-shaped petals. ANDERSON: This is an annual. It’s called elegant clarkia. It’s one of our later spring wildflowers, and it’s quite showy. These are 2-3 feet here but they can get substantially taller. They’re glorious, easy to grow in the garden, loved by a variety of insects, animals, etc. SETZIOL: The tapestry of blooms exhilarates Anderson. But she also sees some plants she doesn’t welcome: she points at a gangly one with lemon-yellow flowers. ANDERSON: This yellow mustard is of European origin and has spread to California. The story goes that when the Spanish were colonizing California they spread mustard seeds between the missions so they could find their way … by following El Camino Real, the mustard road. It’s done very well here, it’s suited to these conditions and has spread everywhere. SETZIOL: The mustard is one of a suite of plants from the Mediterranean basin that has tagged along with people and livestock, and found our similar climate to be quite hospitable. ANDERSON: We see a patch up here of Mediterranean grasses of different sorts. And they have basically taken over all our native grasslands now. So native grasslands in California are a very rare plant community. SETZIOL: UCLA botanist Phil Rundel says these alien plants—and others like the water-hogging, giant cane called arrundo—can do a lot of damage. RUNDEL: Invasive species have dramatic potential to change fire frequencies, fire intensities, they can change nutrient levels, they can crowd out natives and change ecosystem function, change hydrologic flow in streams, a variety of impacts that have huge economic damage. Billions and billions of dollars in the US alone. SETZIOL: One reason why some of these invaders do so well here in California is because the pathogens and predators they evolved with in their homeland are back there … not here. RUNDEL: There’s very little regulation. The state now has a few things they ask nurseries not to sell. There are state agencies that have lists of invasives we’re trying to control. Part of the problem is public education. People aren’t aware what’s dangerous and what’s not. SETZIOL: Rundel says sometimes, alien plants don’t become invasive right away. They hang around benignly for several decades … then suddenly become aggressive - perhaps because the right pollinator or seed-disperser comes along to help them out. The number of alien plants making their way to California is likely to climb as global trade and travel increases. But research scientist Jon Keeley of the U.S. Geological Survey says the plants that are already here are more than capable of wreaking havoc. KEELEY: And the primary driver that affects that transition from native to non-native vegetation is fire…I see it just about every time I drive to southern California, I see a new portion of the landscape that seems to be on its way to being converted to alien grasslands, simply because as the urban development expands, we find that more and more fires are ignited at the most inopportune times for putting them out. SETZIOL: Keeley says, yes, Southern California plant communities evolved with fire, but the shrub-dominated areas surrounding cities didn’t used to burn as frequently as they do now. Blame people for that. KEELEY: If you put too many fires in the landscape, say for example two in five years, those plants don’t have enough time to recover … and as a result, alien species are able to invade and the reason they can invade is they’re a very different life form. The natives are a woody life form that takes a long time to recover, the alien plants are annuals that come in and can regenerate very, very quickly, produce seeds and withstand repeat fires. SETZIOL: And that doesn’t bode well for all the animals that rely on native plants for food and shelter. There’s a bit of good news in the face of this daunting problem: Jon Keeley of the USGS thinks federal land managers with the park and forest services are very aware of the problem . Climbing up Stough Canyon, botanist Ileene Anderson arrives at a plateau thick with California buckwheats, blooming orbs of white flowers. ANDERSON: The rain has definitely contributed to more blooms in general. This year, all the perennial shrubs have really benefited from the rain. SETZIOL: But while the native plants thrive, their alien rivals - mustard, Mediterranean grasses and others - are also doing well … ready to take over when the next fire comes. Botany of Desire: A Plant’s-Eye View of the World, Michael Pollan. This is not about local plants, but an interesting look at our relationship to four domesticated plants. I’m not much of a shopper, but I enjoyed preparing for our son’s birth. I snatched up onesies embroidered with frogs and turtles, blankets dotted with duckies, books about jungles and gardens, and lots of stuffed animals. I diligently, but unenthusiastically, drug home a couple of toy cars. Living in the nation's smog capitol, it's hard for me to be enthusiastic about cars and trucks. Despite a new generation of cleaner cars, vehicles--especially trucks and other diesel burners--are the main culprit. hallway, a cement mixer cruises the kitchen, a school bus bleats the ABC song even after a plunge in the tub (drat!). Among my son’s first and most passionately uttered words were “tash tuck,” “backhoe,” “’cool bus,” and “gee gah go.” Gee gah go—Things That Go—is the subtitle of several books for boys with this fixation. I’m now familiar with such classics as Good Morning, Digger. My son would be content to stand on a busy street corner for hours—if I’d let him. The problem is: busy streets are not good places for kids—or grown ups—to spend a lot of time. Some of the highest levels of pollution in our region are found on/near freeways, and roads with a lot of traffic. In this blog, I’ve talked about baby products that might be problematic, but air pollution is a known and well studied hazard. And it’s the only thing—that I know of—in your baby’s environment that doesn’t meet federal or state health standards. Yes, LA is not as smoggy as it used to be, but so far this year the region has had more than 95 days when the air didn’t meet health standards for ozone. You probably know that a lot of pollutants blow inland and coalesce in places like Riverside, but parts of LA County still have problems, too. For more than a decade, USC researchers have studied kids who live with peak pollution. They found these children are five times more likely to have poor lung function. So when they come down with respiratory illnesses such as a cold, it can be harder for these kids to recover. Low lung function also has long-term consequences; it's a significant risk factor for all causes of mortality. UC Irvine researcher Michael Kleinman says weak lungs can lead to cardiovascular trouble: "The heart and the brain are two organs that cannot tolerate low oxygen supply. So when the heart receives blood with less oxygen, the heart has to work harder. It’s got to pump more blood to deliver the same amount of oxygen to all the other tissues. " Air pollution also exacerbates asthma. One state study suggests kids who live near busy roads are more likely to get asthma than kids who don't. Drive a cleaner car. Many organizations have ranked them. Let leaves RIP: leaf litter is good for your soil, so stop blowing them and cut pollution. Air quality officials say the average leaf blower emits as much pollution in one year as 80 new cars. Also, make your next lawnmower electric. Reduce, Reuse, Recycle: much of the air pollution in our region spews from ships, trains and trucks hauling goods from the ports. Limit the time your child is on the freeway: hitting the recirculation button on your car doesn't keep pollution out. Don’t have your child exercise near freeways or roads with a lot of traffic. For more information, check out this transcript of the first two parts of my radio story on schools that are too close to freeways. SETZIOL: At Edison Elementary in Long Beach, school is out early. Kids are playing tetherball and kicking around soccer balls. Parent Evangelina Ramirez has just picked up her eight-year-old daughter, Lorena. Ramirez says, in many ways she’s pleased with the school. RAMIREZ: It’s a good school. They have wonderful things they do for the kids. RAMIREZ: The only problem is between the exit and the –I don’t know how you say it, la salida and la entrada from the freeway. SETZIOL: entry and exit from the freeway. RAMIREZ: Yes. Entry and exit. SETZIOL: It’s the 710 Freeway … with busy on-and off-ramps right next to Edison playground … and that worries Ramirez. She’s a volunteer with the Long Beach Alliance for Children with Asthma, and she’s heard that air pollution next to freeways and busy roads can be four to ten times worse than background levels. And he daughter Lorena--a sweet-faced girl with shy eyes and a toothy smile--has asthma. 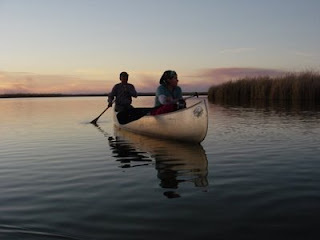 LORENA: when cars are passing…I feel a big wad in my stomach and I can’t breath. It’s like hitting the wad and it doesn’t let the air come out. SETZIOL: Asthma isn’t just a health problem. It’s an education problem. When a youngster like Lorena Ramirez can’t catch her breath, she often can’t make it to school either … and kids who miss school don’t do as well in class or on standardized tests. MCCONNELL: There’s also some suggestion that these local concentrations right around roadways may also impair the level of function of the lungs. SETZIOL: That’s important because poor lung function leaves people vulnerable to emphysema and lung disease later in life. And the state Air Resources Board says proximity to freeways--especially those heavy with trucks--increases a person’s cancer risk. The Long Beach Unified School District says, while it hasn’t monitored pollution at Edison Elementary, it has studied it at a school site it believes to be in a comparable location … and hasn’t found a problem. But the Alliance for Children with Asthma has done its own monitoring at the school and found elevated levels of pollution. To know for sure, more testing is needed. RAMIREZ: Evangelina Ramirez – Lorena’s mom - says many Spanish-speaking parents don’t even know their kids are having symptoms of asthma. RAMIREZ: We want to receive more help with kids who have problems and don’t have insurance. We need health for everybody in the community. We cannot fix the whole problem, but we can do something together and we can make changes together. RAMIREZ: That’s the challenge at Edison Elementary. It’s the same challenge faced by parents at more than 200 schools in Los Angeles. We’ll look at story tomorrow. Ilsa Setziol … 89-point-3 …KPCC. SETZIOL: One of the busiest freeway intersections in LA County is the East LA Interchange. It’s where the 60, 10, and 5 merge near Soto Street. It’s also the location of the Los Angeles Unified School District’s Soto Street School. Margarita Sanchez sends her daughter Meli here. SANCHEZ: We have increasing amounts of down times because of flus and coughs and colds that are exacerbated by the pollution. It makes us more susceptible and less immune. SETZIOL: The State Office of Environmental Health Hazard Assessment - or OEHHA - has mapped California schools near busy roadways. OEHHA defined “near” as 150 meters from a road or a freeway … which is about 500 feet. Bart Ostro is chief of OEHHA’s air pollution epidemiology unit. OSTRO: Roughly 7% of all the schools—and school children—are exposed to 25,000 vehicles a day or more. And there’s nothing sacrosanct about 25,000, but there are some studies that indicate that that’s a bright line that above that level you start to see effects related to traffic exposure. SETZIOL: More than 200 LAUSD campuses – including Soto Street School – are on that list. That’s about 30-percent of LAUSD’s K-through-12 schools. However, it’s important to note that what counts is being DOWNWIND of a busy roadway. A school could be smack dab next to a freeway and not have a problem—if it’s upwind. So it’s not clear how many of the schools statewide might be stuck in a pocket of polluted air. But the OEHHA did study Bay Area kids who go to schools downwind of freeways vs. those that don’t. OSTRO: We found higher rates of asthma and bronchitis in children attending schools near high traffic areas. We caution to say that this doesn’t mean the exposures only occur at the school or during school time. SETZIOL: LAUSD recently began studying pollution sources near its schools. It started with industrial facilities and will soon survey roadways. Angelo Bellomo is director for environmental health and safety. He says they’ve already asked local air officials to study the health risks of their campuses near industries. BELLOMO: We need Caltrans and the transportation authorities to do the same thing with regard to transportation corridors in proximity to schools. SETZIOL: Bellomo wants more data before the school district considers mitigation measures, like upgrading air conditioning systems at the schools. He thinks the additional information will be required to convince lawmakers to come up with money for the problem. But a school district near LAX isn’t waiting. Administrators there are moving ahead improve the air in their classrooms. That’s our story tomorrow. Ilsa Setziol … 89-point-3 … KPCC.